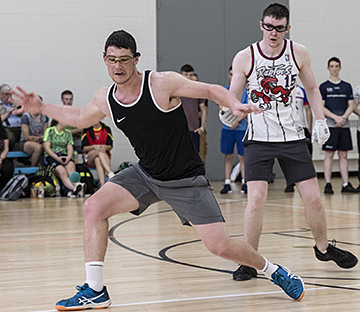 MINNEAPOLIS, Minn. — The 2018 World Handball Championships and USHA Four-Wall Nationals kicked off with wallball and one-wall singles competition in the North Gym at the University of Minnesota Recreation and Wellness Center. Many of the matches on the inaugural day of the tournament were one-sided, but not the Men’s 23-Under contest between Ben Devlin and Jamie Kelly (Photo: Kelly swinging – Keith Thode). Kelly simply dominated Devlin early on, holding his opponent to singles digits in the first game. But in the second, a more determined Devlin kept pace and pulled out a narrow three-point win to force the third deciding game. The two battled to a near standstill in the tiebreaker, but Devlin pulled away late for an improbably victory. The two resume play in their Round Robin division tomorrow. See today’s results along with other draws & start times HERE.